Home » News » English NWOBHM Legends SATAN Release Brand New 7″ Single Via Metal Blade! English NWOBHM Legends SATAN Release Brand New 7″ Single Via Metal Blade! 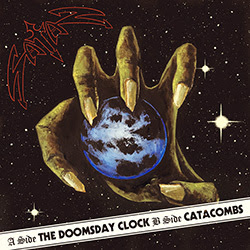 On July 6th, Metal Blade will release Satan‘s “The Doomsday Clock” 7″ single on vinyl and digital formats. The b-side will feature another brand new track, “Catacombs”, an exclusive to this 7″. Pre-order your copies now at either EMP or Metal Blade’s ebay-store. While standard bearers of the NWOBHM movement and responsible for ’83’s seminal Court In the Act and ’87’s Suspended Sentence, with their tentative new album SATAN make it abundantly clear that in 2018 they are not interested in simply capitalizing on past glories. Comprised of 10 tracks of searing metal, it is blatantly and profoundly the work of the Newcastle upon Tyne natives at their very best, infusing their signature sound with a more raw, wild and spontaneous vibe than they showcased on 2015’s mighty Atom By Atom, in the process displaying more passion and energy than slews of bands half their age. Having reunited in 2012 and returned to touring duty, SATAN – comprised of six-stringers Russ Tippins and Steve Ramsey, bassist Graeme English, drummer Sean Taylor and vocalist Brian Ross – once more proved their collective mettle with 2013’s Life Sentence and follow-up Atom By Atom, both records critically acclaimed and maintaining the high standards of their earlier releases. With such a powerful collection in their hands the band were unsurprisingly eager to take it on the road, and they once again had successful tours and festival runs in Europe, North America and South America, culminating with a slot opening for Pentagram in Helsinki, which Tippins counts as a true honor. SATAN will unleash their latest batch of classical heavy metal songs in the second half of 2018. Dissonance Sign DESOLATION ANGELS / New Studio Album Due Early Next Year! Brace yourselves for a new album from these kings of the NWOBHM! There was death, there was doom.....there will always be My Silent Wake! Likely to HAUNT the nation! UK Extreme Metal Legends Akercocke Release New Album Details! The forthcoming Renaissance In Extremis is nothing short of a new dawn for these most eccentric of extremists! SAXON to release Decade Of The Eagle in November! A decade of music like no other!